At Hawkinge Primary School we encourage the development of responsible global citizens who care for and respect their environment. They are inquisitive about and understand the importance of the impact they have on the ever-changing world around them. At our school it is important to us that the children have the opportunity to take part in a variety of geographical activities both inside and outside the school. 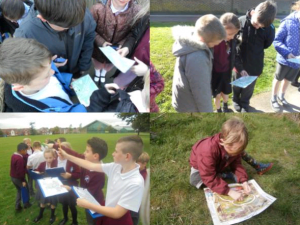 These activities include reading, drawing and making maps; using different computing programs; and taking part in fieldwork both within the school grounds and while out on school trips. At Hawkinge Primary School, we believe in a cross-curricular approach to our Geography lessons and these are taught through a theme which links to other subject areas. We also aim to be responsive to issues and events across the globe. In recent years we have had themes covering topics from ‘Brexit’ through to global warming and climate change. Beginning our themes with a thought provoking question inspires the children to want to know and find out more. To enhance the children’s learning, we regularly encourage visits from different organisations as well as from the family and friends of the school. 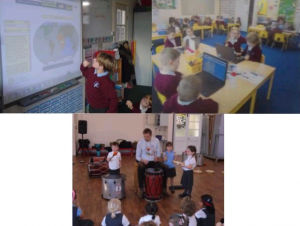 Recently these visits have included talks from a marine biologist, workshops and animal adoption with a member of the Galapagos Conservation Trust, as well as a variety of different music workshops linked to countries being studied. The use of ICT in the classrooms also enables our children to complete their own research on places they are learning about; use photos, videos and games to enhance their learning; and create their own maps through use of a different media. Over the last two years we have encouraged the children to think more about the importance of looking after their environment, recycling and sustainability. The introduction of paper recycling bins across the school has been a great success. The children are very pro-active and think carefully about which bin they should use for their rubbish. Each week children from year 5 and 6 are responsible for collecting paper from the recycling bins and ensuring that the bins are used correctly across the school. 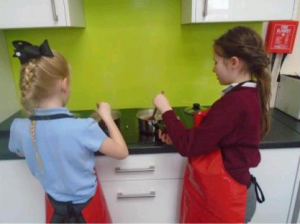 Our Science programme and cookery room also provide further opportunities for children to think about sustainability as they are able to grow, take care of, and cook with different fruits and vegetables. 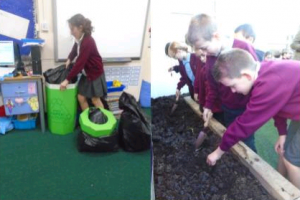 ECO club also enables the children to continue this practise as an extra-curricular activity.